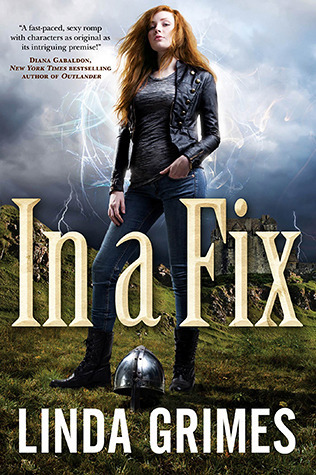 I’ve been awaiting weeks for the 6 months rule so I can finally dare you to read In A Fix by Linda Grimes. It was one of my favourite reads in 2012, quite a feat for a debut author, and I must urge you to pick up this title as the second book, Quick Fix, releases this summer! I was lucky enough to be sent an ARC by the author and I can’t wait to dive into it! Now… back on topic… You have to read In A Fix because it’s an highly original urban fantasy with captivating characters. The humour and the action will keep you riveted to the pages late into the night, beware! Miss Grimes blessed us with a very unique lore. Her main characters are called adaptors. Their particular talent lays in an ability to touch one’s aura and mimic it to perfection. They become an exact copy of their target, right down to their voice and physical abilities. How does it differ from a “simple” shape shifter you ask? First of all, it’s instantaneous, as opposed to a long and strenuous process and the adaptor need to have a direct or indirect contact with the desired aura to be able to change into it. Quite fascinating! The highlight of this novel for me was the characters. Right from the start I felt a connection with Ciel and the two men of her life, Billy and Mark. The three of them are unbeatable and their affectionate banter provides a light spirit in life or death situations. This action-packed story features Vikings, no less, and around the world travelling. I truly enjoyed every moment of this exciting and engrossing instalment so I am daring you to read it to! I read In a Fix and loved it! I loved the characters and the originality. I'm so excited to hear that there's a sequel! Going to check it out!